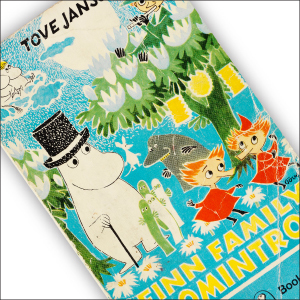 The Moomin series of books and comics by Tove Jansson were major literary touchstones of my childhood and youth, and another sign that my fascination with all things Scandinavian began quite early. Retreating to Tobe Jansson’s mystical, wonderful world was a joy, a chance to be a part of a universe where everyone was valued, and lessons were learnt. Thankfully though it wasn’t syrupy or soppy; the Moomins weren’t portrayed as sappy do gooders at all or doormats to be walked over. Rather, they were simply a loving family that accept anybody and everybody as equals and as people worthy of full and unconditional inclusion in their social group. It reflected very much the Scandinavian ideals of the time – that everyone, no matter how odd or strange was equally worthy of being treated well and loved and cared for, with no judgements made. To a kid unconsciously struggling with his sexuality, and acceptance by his peers, and with a church environment that, though caring in parts, was also harsh, unforgiving and thoroughly judgemental too, spending time with Tove Jansson’s wonderful creations instilled in me a hope that things could and would get better. 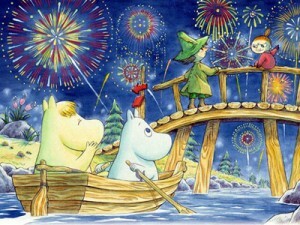 I knew, of course, they were only stories, and sometimes this cause me great sadness as I despaired that anyone anywhere could be as lovely as the Moomins, but then I would read some more of their adventures and be strangely reassured for that bubble of time at least that everything would be all right. It was amazing to think there were just nine book in total because I felt like Tove Jansson took me on journeys uncountable. But then the books weren’t the only thing that this gifted writer came up with. She also wrote a series of amazing comic strips that further continued the story of this amazingly diverse family which by all accounts was based on Jansson’s own family. 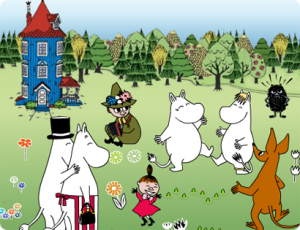 The main members of the Moomin family were Moominpappa, Moominmamma and Moomintroll but they were joined by a whole host of other characters, including Sniff, Little My, Hemulen, Moomintroll’s best friend, Snorkmaiden, and her brother Snork. They either lived with the Moomins or in the surrounding valley, and were accepted as members of the family without question. This sense of inclusion was based on Jansson’s own bohemian upbringing. 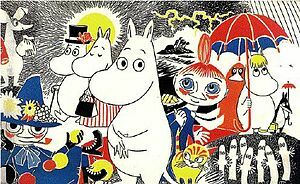 Her parents, Vikter Jansson and Signe Hammarsten-Jansson, loved being close to nature and were extremely tolerant of diversity, a facet which was reflected in every book and comic strips about the Moomins. The Moomins have now gone on to great success and worldwide popularity, affectionately referred to as the Moomin Boom, thanks largely to a 1990s animation series and even a Moomin theme park in Naantali, but they will always remain for me a loving family who took me away to an almost unimaginably safe place where it was totally acceptable to not be one of the crowd, and where individuality was valued and cherished. For a young boy afraid of a world where he didn’t really feel he belonged, this was the greatest gift of all, and it is why the Moomins have journeyed with me from childhood to the wide open frontiers of adulthood.